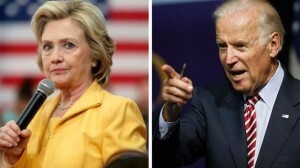 Aides close to Hillary Clinton are getting increasingly nervous that Vice President Joe Biden may throw his hat into the 2016 presidential race later this summer, Democratic sources told Fox News. The sources said that eyebrows were raised recently at Clinton’s headquarters in Brooklyn when Biden’s chief of staff at the White House, Steve Ricchetti, was spotted having breakfast recently with major Democratic donor Louis Susman, a Clinton friend who served as U.S. Ambassador to the United Kingdom under President Obama. After the breakfast, sources said word spread quickly inside Clinton’s camp that Biden’s team appeared to be sounding out top fundraisers about whether the vice president can raise the necessary cash to compete with the Democratic front-runner at this late date. An aide to Clinton disagreed with that assessment in an interview with Fox News, saying there has not been any change or new focus on Biden. Susman previously raised money for the presidential bids of John Kerry in 2004 and Barack Obama in 2008. While that phrasing may leave the door open to Susman and other top Democrats raising cash for Biden down the road, the vice president’s office is not encouraging the presidential speculation while also still not closing the door completely on a bid. The Wall Street Journal reported on June 28 that before Beau Biden’s death, the vice president’s son urged him to run for president one more time. Biden aides however say it is still too early for a decision. Meanwhile, another powerful Dem sitting on the sidelines right now is former presidential nominee and Secretary of State John Kerry, who said earlier this year he hasn’t thought about another run.